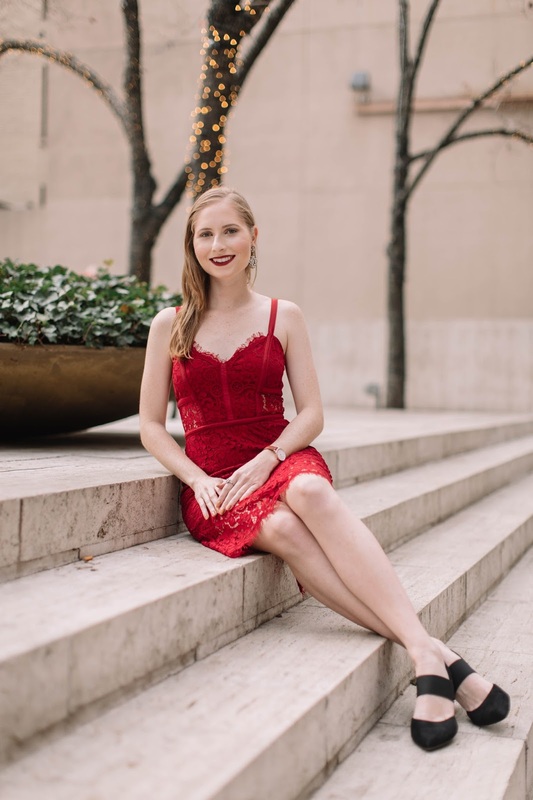 When thinking about what to wear for a photoshoot spent in New York City, I pictured a bright red dress. 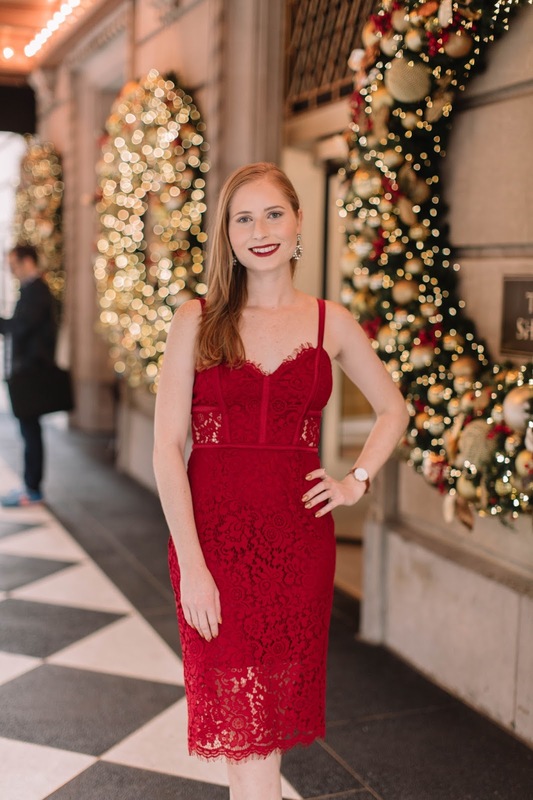 Nothing screams "holiday dress" like a pop of hot red, right!? Although my suitcase was overflowing with cozy knits and dark wash jeans, I still didn't bring anything close to a red dress. After a day at the outlet mall, I stopped by Express to check out their selection of deals. I've been shopping there a lot more frequently than ever before, as they have 50% sales every week! Talk about saving a lot of cash during the holidays. This RED PIPED SHEATH DRESS was the very first dress I saw. I took a few sizes back into the fitting room and instantly knew I found the dress! The dress hugs my curves and is so glamorous for this time of year. I chose the size 0 because it fit me without having the straps fall down. The red makes it appropriate for holiday parties or for a date night out to dinner! 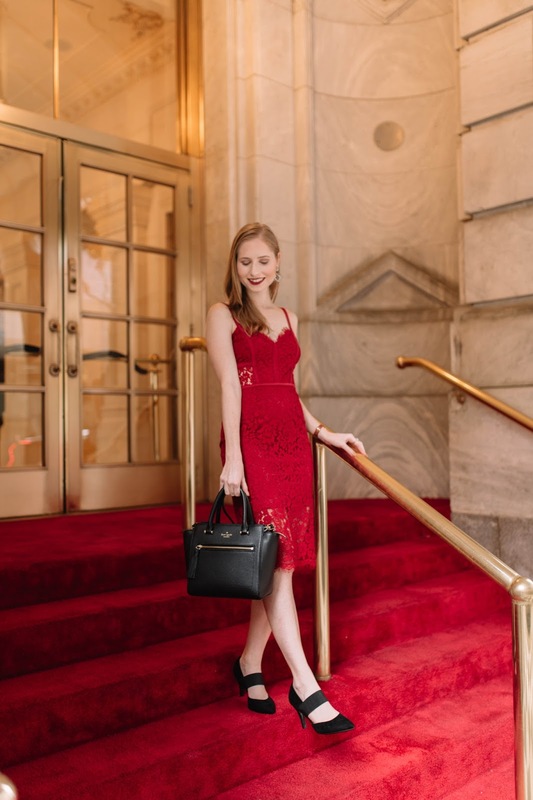 I decided to take my new red lace dress with me on the train ride to the city later that week for the photo shoot I planned at the Plaza Hotel to embrace the magic of the city during the holiday season. I'll be posting more photos from the day over on my INSTAGRAM account, too. I truly lucked out with the weather situation, because the temps were in the mid-60s for the day! Carrying my essentials for the day is my brand new KATE SPADE tote. Just look at the adorable tassel on the front! I love little details like that on a handbag, it really adds some character.